Representing a list that originally ran in 2010 but is still relevant and fun in 2014! This seemed like a perfect time to take a look at some of the most all-American comics covers ever published. Yeah, these are my own special favorites, but I think you should enjoy my choices. Oh, and in the interests of not having every cover be from an issue ofCaptain America or Superman, I tried to only chose one from each series. Take a look at my choices and be sure to let CB know your favorites! Superman taking the oath of office as President? Doesn’t everyone know he was born in Kenya – umm, I mean, on Krypton? He’s not really allowed to become President, but shh! Don’t tell anyone on Fictional DC Earth! Still, it is kind of comforting to have a man like Superman taking the oath of office and taking over as the American President in a time of crisis. The crusader for truth, justice and the American way really should be President, don’tcha think? As long as he wouldn’t push for universal health care, that is. If he did, he would be Super Hitler and not Superman. Can you get more of a swaggering, all-American image than this picture of Uncle Sam, sleeves rolled up, ready for a hell of a fight? Heck, looking into Sam’s face, I’m ready to jump off my couch in Washington State and enlist to fight those Ratzis! 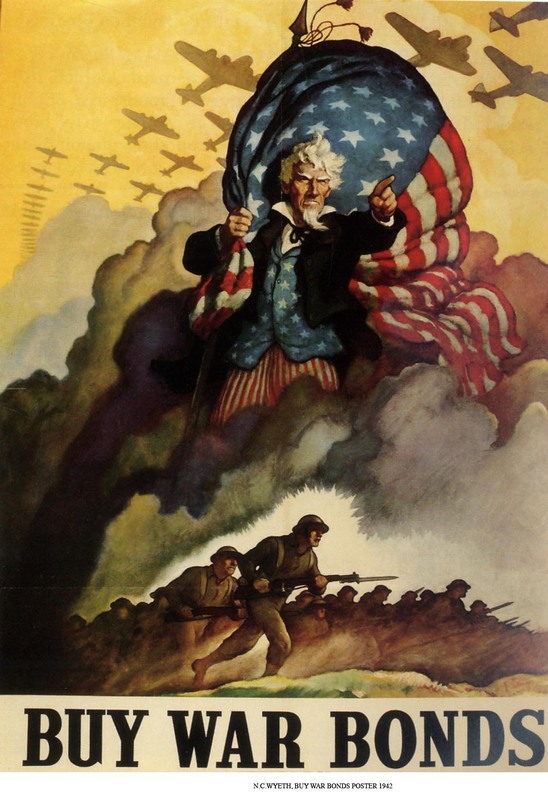 Just look at that sinewy power and look of righteous fury on Uncle Sam’s face! This is just an awesomely beautiful piece of propaganda from the great and vastly underrated Reed Crandall. If you’ve ever seen the movie, or, even better, read the terrific book Flags of Our Fathers, you understand the amazing, real-life story of the American military forces that were part of the invasion of the tiny Pacific island of Iwo Jima. Of course, that image has been immortalized in sculpture and in painting – and also on the cover of a comic book cover by one of comics’ greatest cover artists, Howard Chaykin. As a symbolic moment summing up both the American war in the Pacific and the astonishing battles of the Blackhawks, this cover stands alone. I love how Chaykin expertly approximates the famous sculpture on this cover while still giving real character to the men he depicts. Add the spectacular background and you have an amazing piece of comics art. And speaking of Chaykin, here’s another piece produced by him in that same year. What can I say? I love Chaykin’s work from time period, and American Flagg! is still one of my favorite comics of all time. But this is a cover that positively demanded being part of this list. From the spectacular red, white and blue screaming eagle logo to the overlapping flag background to the look of fury on Ruben Flagg’s face to the strong, bold, solid colors on the cover, this piece still jumps off of the computer scene with the same power it had some 27 years ago. And the comic inside is one of the greatest of its era. How can you get more all-American than a cover featuring perhaps our greatest President, Abraham Lincoln, which includes some of his greatest moments? Answer: Honest Abe is so American that he makes Ruben Flagg look like a wimp – even if Flagg is a womanizing, gun-toting, gang-fighting wimp compared to the man who held the United States together. It’s interesting that the Grand Comics Database credits John Buscema as the artist on this cover. I’m not sure I see a lot of Buscema in this cover, but it certainly seems appropriate that the man who drew the uber-masculine Conan also drew the uber-American Lincoln. As if you needed a reminder that “Dell Comics are good comics!”, look at this gorgeous painted piece that puts the Lone Ranger and Tonto smack dab in the middle of the War Between the States. Dell was justifiably famous for the quality of their covers, and this one was painted by the great Henry Hartman, who was one of the finest cover painters of his day. Just look at the drama of the moment – the weathered face of the soldier in the foreground, the men on attack in the background, and the wonderful way that the logo accentuates the power of the flag behind the Ranger. Of course the Ranger was on the side of the North, because they don’t come much more American than the Lone Ranger. Don Newton was an artist who burned very bright for a period of about ten years in mainstream comics, doing wonderful work on Detective Comics, New Gods, “Shazam” in Adventure Comics and a series of comics for Charlton Comics. Newton’s most memorable work at Charlton was on the longtime comic-strip favorite The Phantom, and his very best issue was #74. Released at the tail end of the Bicentennial year,Phantom #74 put the Ghost Who Walks at the time of the signing of the American Declaration of Independence. So this very patriotic cover was entirely appropriate for both the year the comic was released and the year that the comic was set in. As you can see, Newton was a master of coloring, using the colors in the painting to accentuate the drama of the scene. At the height of World War II came this elegantly simple piece by the great Mac Raboy. Our cover star, Captain Marvel Jr., got his powers as the result of an attack by Captain Nazi, so it’s no surprise that Jr. was devoted to the war effort. I love the quiet power of this piece. It should be no surprise that there were a lot of choices for great Captain America covers for this article, from the cover to his very first appearance in 1941 to this poignant cover that features the Twin Towers to this powerful image of the American flag flying over the scene of massive destruction. But my favorite Cap classic is this movie-style poster on the cover of the first issue from volume 4 of Cap’s series. There’s just so much going on in this majestic and powerful piece of art that it has to rise to the top of my list. Feel the power! I received mail over the 4th of July weekend that indicated to me that this piece was a tribute to a War Bonds fundraiser painting by N.C. Wyeth, which you can see here. Cassaday discussed his love for Wyeth’s work in a blog post in 2000, so I’m sure the tribute is entirely intentional. But the very top of the list has to go to this iconic cover, maybe the best representation of Superman as the living symbol of truth, justice and the American way. There’s a certain kind of classic elegance to this image that was created shortly after the bombing of Pearl Harbor. The simplicity of the image gives it an almost iconic power, and the black background makes the main images seem to pop off the page. This cover is such a classic that DC released a wonderful statue of the cover. How can there be more of an all-American image than this one?